Now celebrating his 21st season as Music Director and Conductor of the University of Illinois Symphony Orchestra, American conductor Donald Schleicher has also served as Music Director of the Quad City Symphony Orchestra and as Music Director and Principal Conductor for the Pine Mountain Music Festival. He is frequently invited to lead performances or provide conducting master classes at many of the countries major music schools such as the Oberlin Conservatory, Eastman School of Music, Baylor University, University of Minnesota, Ithaca College, Ohio State University, the University of Missouri, and Shepherd School of Music at Rice University. As an enthusiastic advocate of public school music education, Mr. Schleicher has conducted All-State orchestras, festivals, and youth orchestras in nearly every state of the United States. He is also active as a clinician for public school music educators. 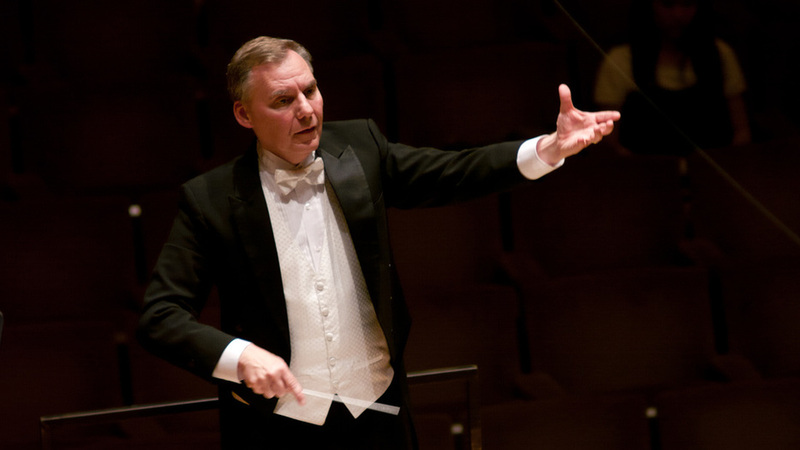 As a conducting professor, Mr. Schleicher’s class at Illinois is an international draw for talented young conductors. Many of his former conducting students have gone on to hold prestigious positions with organizations such as the San Francisco Symphony, the New York Metropolitan Opera, the University of Chicago, Richmond Philharmonic, the Philharmonia of Kansas City, and the Hartford Symphony. In the summers, Schleicher serves as the lead teacher for the International Conducting Workshop in Sofia, Bulgaria and the International Conducting Institute in Zlin, Czech Republic. He is also the principal teacher for the annual Conducting Master Class and Workshop Series in Chicago. As a dedicated advocate of contemporary music, Donald has collaborated with leading composers including Chen Yi, Michael Daugherty, and Frank Ticheli among many others. In December of 2014, his collaboration with Augusta Read Thomas led to a recording project of her works now available on Nimbus Records.